It always baffles me when organizations don’t set goals for their employees. How are you supposed to know if an employee is performing if you don’t set goals? 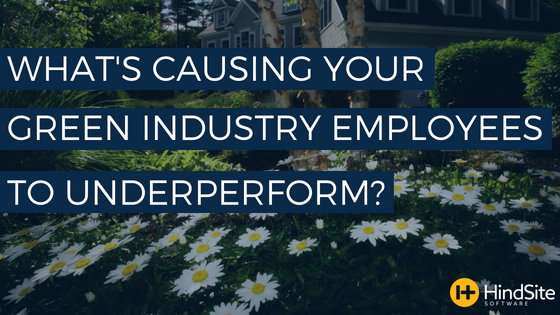 Many small businesses don’t because they simply lack the mechanism to track performance. Employees also tend to dislike goals, and often for good reason. If you’re not setting achievable goals, employees are going to balk at the exercise. One great goal for your field staff is to have them reach a certain threshold for billable time. If only 50% of their time is billable, they’re really only earning their pay half the time. If you need help tracking billable time, consider installing field service software that lets them time in and out of jobs so you can see how much time is spent on a worksite – and how much is wasted. If you’ve worked for different employers, you know what I mean when I say how important a culture is to employee performance. I’ve heard horror stories from people who have worked for companies where turnover was so rampant – both forced and voluntary – that employees were afraid to do anything for fear that they’d get fired. Fear stifles innovation and productivity. Create a culture that empowers your employees to make good decisions and rewards them when they do. But you also don’t want to create a culture that’s too loose and relaxed and where poor performance is ignored, or worse, celebrated. Create a culture of accountability, one that recognizes your high achievers and motivates everyone to be a high achiever. To do that, you need numbers to hold people accountable to achieve. Surveys continue to show that the main reason people choose to leave organizations is poor management, specifically, their immediate supervisor. If you have incompetent management, you’ll know it. You’ll probably hear a lot of “noise” in your organization or even see employees leaving for greener pastures elsewhere. One way to avoid poor management is to be very careful when selecting your supervisors. In a lot of small businesses, the most tenured employee becomes the supervisor. The thinking is that they know the most and can share the most knowledge. But that’s a poor way to select a supervisor. Supervisors need to have different skills. They need to be able to manage and motivate people. They need to be able to mediate disputes. They need to be able to communicate succinctly. And, most importantly, they need to lead. Not all of your most tenured employees have these attributes, so go beyond experience to find the right supervisors. If you think your employees are underperforming, ask yourself if you’re setting appropriate goals, if your culture rewards people who go the extra mile and if your managers have the skills necessary to lead your organization. Invariably, if you fix one, two or all three of these issues, you’ll fix your performance issues.